You would think that being the founder of Glitter Guide I would always dress bold, colorful, and bedazzling. But to me being "glittery" means being confident in your own skin and knowing when to keep it simple. I've never subscribed to the notion of "more is more". Don't get me wrong I love decadence and glitz, but I also like minimal and easy. There are times when I go out with very little makeup, my hair messy from the day before, and no jewelry. It feels good to care about what I'm wearing, but not enough to fuss over it: plain and simple. sometimes simple is totally the best! love this outfit on you!! gorgeous coat and gorgeous pictures! i attempt to follow the the phrase "chase simplicity," however i seem to sometimes over do it; with makeup, jewelry, etc..
so i love this post and totally agree with being "glittery" should mean being comfortable and confident in what you are wearing and how you present yourself. I'm hyper-obsessed with that bag -- I love it! So classic and goes with absolutely everything. You look gorgeous! I love this look on you Taylor, chic and sophisticate,d you look fantastic! and i love seeing the cherry blossom! So pretty! Great post :D I agree, it's good to know when to keep things simple and when to get a bit out there. Like you said as long as you're comfortable with what you're wearing then who cares?? plain and simple BUT super chic! Beautiful :) I really love your coat! Agreed and I love the combo of the pink and grey with the pretty pink lips! i completely agree! sometimes, i love to be bright and flashy, but most of the time i prefer minimalist stuff like my skinny jeans, a loose-fitting tee and chuck taylors. no muss, no fuss. gorgeous pictures, love this outfit! Love the cute simple outfit....that bag is awesome!!! Totally comfy-chic - my favorite "trend" to rock :) Great look. That jacket is the perfect bit of girly casual. Amazing, as usual. yes, totally agree...simplicity speaks to me, too. love getting dolled/jazzed up but sometimes being simple takes the cake! I completely agree. You should never have to try too hard with your own style. It's all about what you feel confident and great in. These are such beautiful pictures! I love the outfit, and I can't believe that coat is from H&M, it looks really great. Simplistic is sometimes is the most beautiful - true in your case today! Love it! A great reminder that pink and grey are terrific fashion combos. i think i'm on the plain and simple train a little too often haha. jealous of your rebecca minkof bag!! Sometimes simple really is best - you look lovely! I really love that jacket - is it sweatshirt material? Minimals a huge trend right now, you look lovely. Great bag! Thanks ladies. I never realized how much I like pale pink and gray till now! You look so gorgeous. The colors are amazing on you. Though this look is simple, it's chic and sophisticated. Love it. I discussed the same topic on my blog last week after reading a post by Habitually Chic author Heather Clawson. You do like very confident and comfortable! AMAAAZING! I love how simple and chic this is! I love that jacket and the colors grey and pink on you! You look so stunning. The button up is divine! Love your outlook - confidence is the key to feeling / looking great!! I love the pink tree in the background, it makes your shirt color pop just the right amount. The jacket is cute and looks comfortable. Gorgeous!! Love it! Really like the way your hair looks too. And the shirt buttoned up all the way - it looks so fresh! you are proving the point that one can look just as fashionable wearing simple basics as wearing lots of sparkles/layers/patterns etc. this outfit is so pretty! ver cute taylor!! and I lo e the dress! It was so nice meeting you at Lucky FABB. I love the plain + simple look. Sometimes it's refreshing to own a down-played look. You have made dressing down to an effortless art form. I love the lines of the outfit and the charm of the photos. I love that concept: care about what you are wearing, but not enough to fuzz over it! p.s. I love those pictures with the cherry blossoms and your hair looks great! Pink is definitely your color! And that first photo is gorgeous! The "plain and simple" look is just as pretty on you. 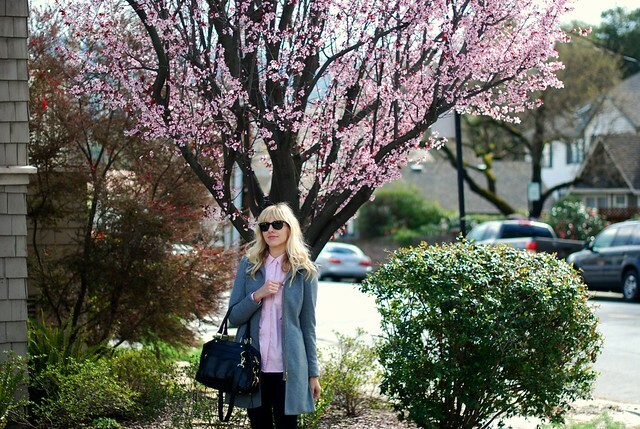 I love how the pink RL top goes with the blooming cherry blossoms...and that Rebecca Minkoff satchel is complete eye candy. your top & the trees perfect! i can't wait to get out of this mn winter! I love that this outfit is so plain and simple. sometimes as style bloggers, we try to "dress to impress" too much and veer away from everything, good old fashion STYLE! i love plain and simple, you still look extremely put together and beautiful, more is NOT more, i totally agree. i love the pretty pink blossoms on the trees!! I love how the pink from your shirt matches the cherry blossoms! Plain and simple is definitely the best choice sometimes, and this looks like one of those times! I really like this outfit! So cute! Love your lipstick/lipgloss color! What brand/shade? you look great here! the first shot with the blossoms is beautiful! Wonderfull. I love proper buttoned up look. Amazing coat! 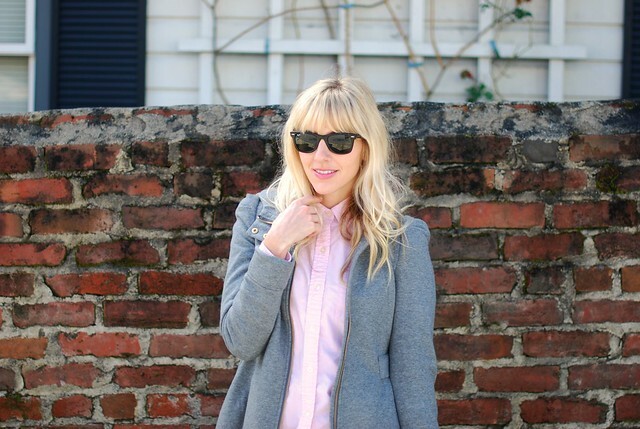 Heather gray and powder pink are lovely on you! You look fab! I love your pink shirt beneath the pink tree. Taylor that's one for a frame!! I love the jacket--so chic and simple, with the hood as a surprise in the back! Spoken straight to my heart. Inner magpie, glitter girl to the core, but mostly always simple and easy. LOVE this jacket - may have to hop over to H&M tomorrow pronto! I feel like this is me most of the time. I really need a reason to get all spiffed up, unfortunately. Most days are super casual and easy. You look super comfy, but still pulled together. Love it. That last photo in particular is so darn amazing.